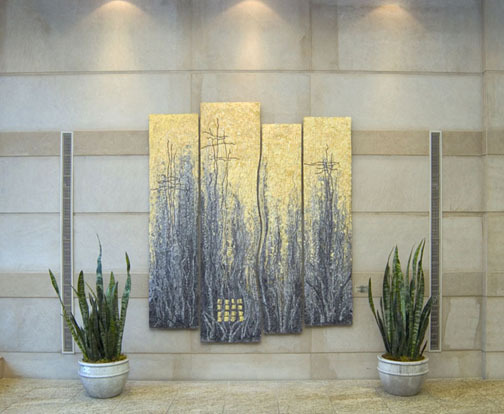 This 4-panel wall hanging was installed in the entrance to the lobby of the Minto Yorkville Condominium complex at the corner of Bay St and Yorkville in Toronto. This entranceway features a bold light fixture that recalls the lower arc of the sun, outlined by an grid of fine dark lines. Just outside, the driveway is ornamented with an open sculpture of interwoven metal strands, much like the branches of trees. 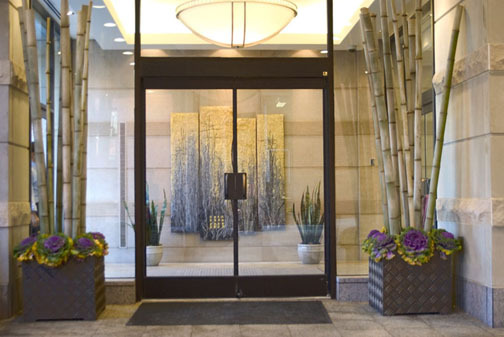 The Lobby itself contains grid-like motifs in various surfaces as seen through the glass. These were inspirations for the wall hanging "Illuminance".